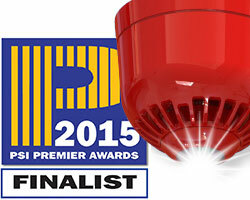 Klaxon's Sonos Pulse EN54-23 fire beacons have been nominated for a PSI Award - Fire Safety Product 2015. Relying on audible fire alarm notifications alone disadvantages people with hearing impairments or those working, or living, in sound reducing conditions. Sonos Pulse beacons produce a light output that can protect most rooms with a single device. Sonos Pulse beacons are unmissable and unmistakable, attracting attention from those not looking at the device and otherwise preoccupied with other tasks. The PSI Premier Awards are special because professional security installers, the most important people when it comes to product selection and system design, decide on the most deserving nominations. We believe that our Sonos Pulse fire beacons should be recognised as the leading Fire Product of 2015. If you share this view, please vote for Sonos Pulse today! Texecom's Premier Elite Apps have also been nominated for Intruder Product of the year.